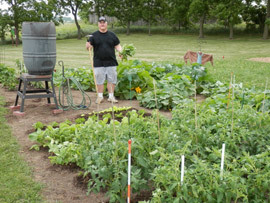 ADVOCAP partners with the University of Wisconsin Extension and other community agencies to provide garden plots to families who wish to raise their own produce. Over 100 families are able to supplement their meals with wholesome food that they raised in the community garden. Oshkosh single plots (about 800 square feet) are rented for the season for $15. Ripon single plots (about 400 square feet) are rented for the season for $10. To learn more about the community gardens or for more information about renting a garden plot, call Pheng Xiong at ADVOCAP's Oshkosh office, 920-426-0150, Ext. 3257. Good nutrition is critical to good health, no matter what the age. Studies show that the right diet and adequate intake are especially important for older people and that poor nutrition is the biggest threat to an older adult’s independence. The Nutrition Program offers tasty, nutritious meals to older adults at senior dining sites and delivers meals to homebound persons throughout Winnebago County. Each meal provides at least 1/3 of the daily amounts of nutrients needed to promote good health. Participants are encouraged to donate toward the cost of the meal, but no one (aged 60 or older) will be denied a meal regardless of their ability to donate. Who is Served: Anyone aged 60 and older. Spouses of seniors and some disabled person are also able to participate in the program. Daily meals are served Monday through Friday at all meal sites between 11 am - 12 pm. Please check with the meal site or the Neenah Office for the current serving time. To make a reservation, call your local meal site listed by noon the day before you wish to dine with us. Meal reservations can also be made by calling ADVOCAP's Neenah office at 920-725-2791. To view Meal Site Locations, click on "Meal Sites and Menus" located on the upper left side of this page. Home delivered meals are great for folks who cannot get to a meal site and who meet certain eligibility requirements, but still need a nutritious meal. Noontime meals are delivered through out Winnebago County. Friendly drivers bring delicious, home-style, freshly prepared meals delivered to your door Monday through Friday. Re-heatable meals for the weekend are also available. Every delivery comes with the well-being check that we have become famous for! To arrange for delivery of home-delivered meals, call ADVOCAP's Neenah office at 920-725-2791. TEFAP is a federal program which provides emergency nutrition assistance, food commodities, to households at or below 185% of poverty level, including the elderly and homeless. ADVOCAP is one of 16 organizations in Wisconsin, which administer the distribution of these foods to a network of nine food pantries, one meal site and several shelters. These community based outlets then provide the commodities along with privately donated foods to individuals and families, either for household consumption or through congregate feeding sites. This food and the meals are provided at no cost to households in need. The groceries provided usually include a variety of canned vegetables and fruits, pasta, beans, rice and/or grain products. The protein items may include canned tuna, salmon and meats, peanut butter and frozen chicken or meat. This supplemental food typically will provide groceries for a period of 3-5 days for an individual or family.